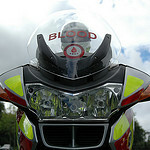 In another of our occasional guest posts, Gordon Kiely takes us behind the scenes with Blood Bike Leinster. 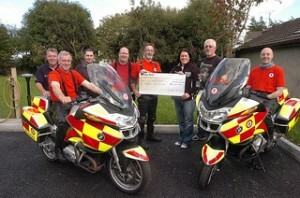 Words by Gordon Kiely, pictures by Blood Bike Leinster. 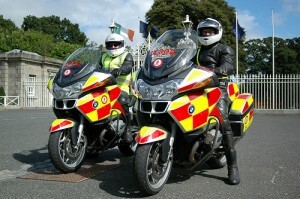 We at Blood Bike Leinster provide an out of hours service to the hospitals in the mid Leinster area free of charge. We operate nightly from 7pm – 7am and a full service from Friday evening right through to 7am on a Monday morning giving 24 hour cover at the weekends. Every now and again we will be requested to do a run outside of these ours and as parents and family members ourselves we endeavor to assist in these calls as much as possible and anything involving children is always close to our hearts. We not only transport blood but we carry items that are are urgently needed such as medicines, scans, files, equipment and breast milk. 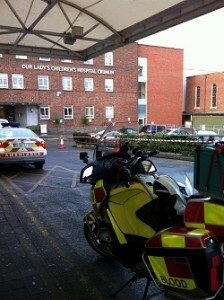 Last week I received a call on the Blood Bike Leinster Controller phone which was requesting our assistance in collecting breast milk from Crumlin Children’s Hospital and delivering it to a Hospital in Galway. I was advised that an infant was in need of this breast milk and was advised it was needed as soon as possible. Our rider who was not on duty until seven o clock that night was getting the duty motorcycle ready for his nights shift that evening when he received a call for his assistance in this delivery. As soon as he received the call and accepted the run, he changed into his protective gear and headed for Crumlin for the collection. Once our rider reached the hospital he updated the controller as to his arrival and advised that he would be picking up the Breast milk and would advise when he was departing. Once the precious cargo was secured in a specialised “Milk Porter” which is temperature controlled and transported to the highest standards our rider advised of his departure from the hospital. Breast milk is received frozen and is donated just like blood by willing donors and can be a lifeline to newborn infants for various medical reasons. Our rider now on the road would be out of contact until he reached his destination, so our bike tracking system was activated to constantly update his location and speed. This is a valuable resource as to enable us to be aware of the riders status at all times. We are currently trialling an app based tracking system that can track multiple bikes simultaneously and can be viewed on a webpage available on laptop, PC or smartphone. With traffic heavy out of the City and out the N4 our motorcycle proves its worth at negotiating through the tailbacks with our rider drawing on his expert training through a RoSPA qualification which is currently set at Gold or Silver for our riders, this is the highest international qualification for civilians. Other road users are aware of our motorcycle and rider due to our high visibility livery, high visibility clothing and white helmet. Our motorcycles are fitted with emergency lights and sirens although thankfully they are not necessary on this run. Almost all of the other road users are quite courteous and obliging to us on our runs and we receive a very positive response from the public as a whole, and we are very grateful for this. As our rider arrived at a pre organised location in Athlone a rider from Blood Bike North East who was on route to Galway on separate run had just arrived and was on an unrelated run into Galway. We have an excellent working relationship with our colleagues at Blood Bike North East who are based in Cavan and we assist each other in many ways including cooperating on runs that involve different areas. After a brief handover, completion of documents and an update to the controllers both riders were on the road again and the milk was on its way to a baby in need. Our rider returned to his home and refilled the bike with petrol and completed safety checks on to make sure it was ready for the next call. All of our riders and controllers are volunteers and receive no payment whatsoever for their time and receive no reward or expenses. We are always looking for volunteers to join us whether it be fundraising, riding or organisational we will welcome you to our team. “People give blood for free so it should be delivered for free”.